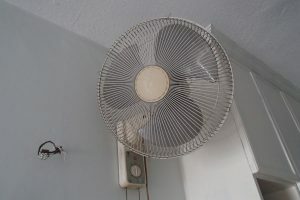 Originally, it was a wall fan. Perhaps it was old, but it was in perfect working condition. When I got hold of it, I decided to modify it into a disc sander. The motor was not very powerful, just 55 watt, so it could not drive heavy loads. But as a wall fan, it should be able to rotate a sanding disc. 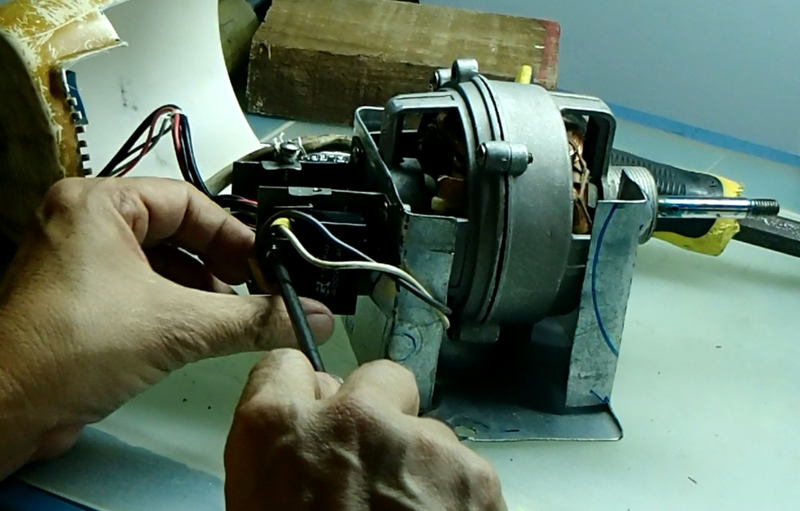 The motor was a capacitor start-run motor. As a wall fan, the motor was mounted on a vertical shaft axis so that it could swing from left to right and back. It had a selector switch for speed control and a switch for oscillating movement mounted separately in a specially shaped protruding housing which was mounted on the wall. The latter switch controlled a geared motor which drove the oscillating movement through some mechanical linkages. However for this project, I was only interested in the selector switch for speed control, so I removed the other mechanisms. I considered the existing arrangement of supporting the motor on a single vertical shaft too weak for my purpose, so my first task was to find a way to support the motor at both ends to make it more stable. As I still had some spare sheet metal from salvaging a computer housing, I decided to make use of these for supporting the motor. As before, since the sheet metal were not new, they contained parts which were pressed into shapes. I just had to work around these imperfections. My aim was to make them able to fit into the original motor housing. Original end plate with a step was further away from the motor. 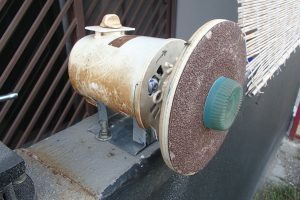 The motor was enclosed by a split plastic housing. 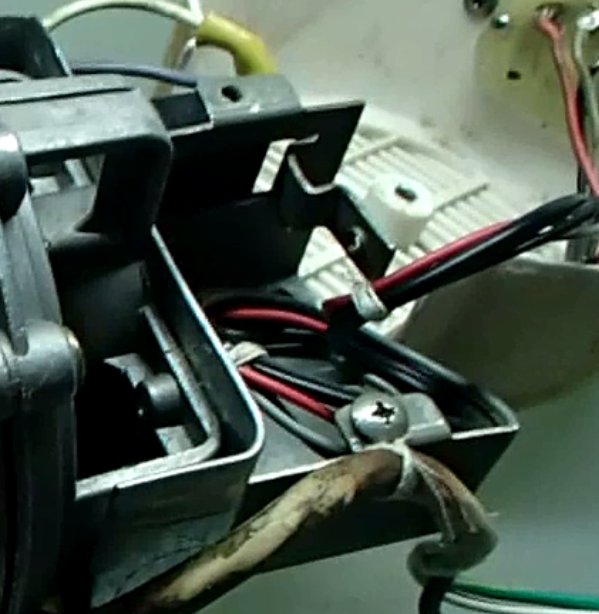 One flat-cover was fixed to the drive end of the motor, while another cup-shaped cover was axially screwed on at the back of the motor so that both covers would match perfectly. 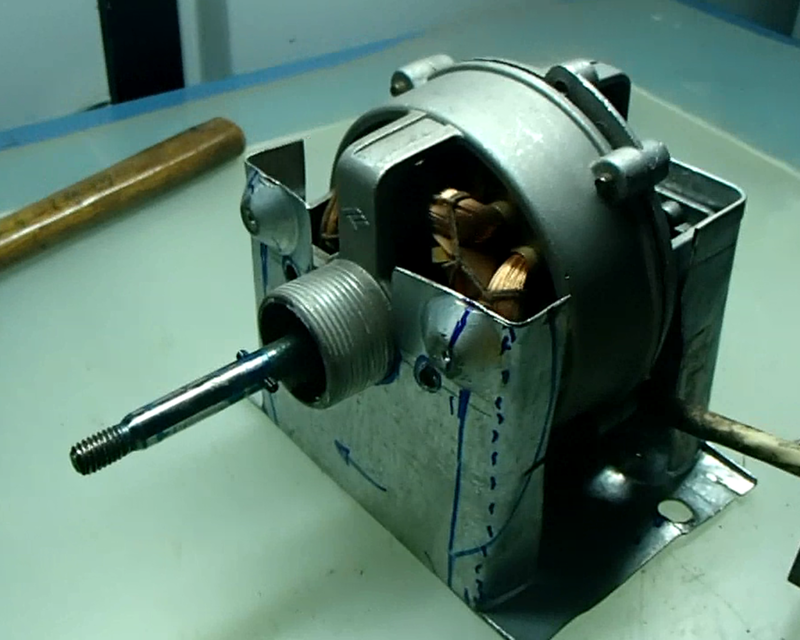 The sheet metal support for the motor was made so that the motor could be secured to it by the existing bolts. However, the addition of the sheet metal support made the motor assembly slightly longer axially. The plastic housing for the motor was displaced further apart from each other. This resulted in a slight gap between the housing covers when they were screwed back again. Threaded plate for motor housing was straightened so that it became closer to the motor. 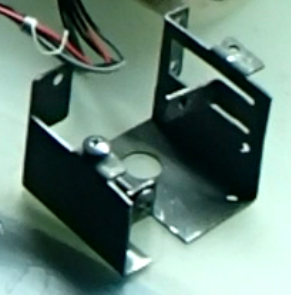 This was to allow the motor housing to still cover the motor without any gaps, since the motor had become longer due to the additional thickness of the motor support plates. In order for the existing motor covers to close back axially, the threaded hole at the back end of the motor assembly needed to be moved closer to the motor, so that the distance between the covers remain the same as before. In this case, the sheet metal strip with the threaded hole could be flattened and then bent into the required position quite easily. The original end bolt of the motor housing was replaced with a longer one. Some portions of the motor cover also needed to be cut out to accommodate the additional motor support. Next came wire management. The intention was to terminate the electrical wires for safety and to secure them so that they could not be easily pulled off. The earthing wire was also attached to the exposed steel support parts. Other considerations was to protect those wiring that could potentially be damaged due to vibrations. Disk sander ready to use. Support for work piece will be added in later. Once the motor was ready, I focused on making the disc sander. The flange was cut out of 11 mm plywood and a center hub was glued on to it. Then I tried to true up the rotating plywood flange by sanding off the high areas while it was rotating by the motor to make the disc truly round. When I was satisfied that the flange was true, a sanding disc was attached to it and secured by the original fan blade center locking screw. The initial test run was considered successful. My next plan was to make some work-piece table support for it so that it would truly function as a disc sander.